Performed in English and French with Korean surtitles. 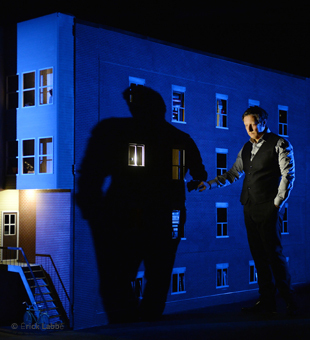 Robert Lepage has expanded the boundaries of modern theater with his spellbinding stage and creative storytelling. His works like the Andersen Project, Needles and Opium, and The Far Side of the Moon presented and re-presented at LG Arts Center have proven his prominence as the true master of our time. While he is well-known for performing himself in most of his directed plays and delivering an outstanding character, 887 will be the first opportunity in Korea to present such talent and proficiency as an actor. An autofictional work based on his own stories, 887 was inspired somewhere between old memories that remain vivid and new memories that are shortly lost. Lepage invites us to a vast journey of ‘memories,’ delving into issues such as the functional mechanism of memories in our brain, the question of completeness of memorized data, identity formed through memory, oblivion and subconsciousness, personal, private memories in contrast with social, collective memories, and the origins of theater. The title ‘887’ comes from the address of his childhood home in Quebec City, ‘887 Murray Avenue.’ It is not only a geographic location but also a symbolic, internal space that keeps the memories of the small house where seven members of the family squeezed together, neighbors with distinctive characters living in the same apartment, familiar sounds and landscape of the neighborhood and the streets, and everything else related to the city. The rotating set transforms into various spaces; miniature models seem to represent the memory; and old photos and newspaper images are kept aside in an old box. These are someone’s memories and at the same time a common history that we have lived through together. Lepage has an ingenious talent in weaving a story together and unfolding it in front of our eyes. Through 887, he will mesmerize us and summon the complex, nostalgic internal feelings we have for the past and the present. For those who would like to cherish the old and continue to remember them with meanings attached, you should not miss Robert Lepage performing 887 in May.